Comfort and power come together... more horsepower, better results. * For ABN Holders Terms & Conditions Apply, Based on 1 / 3 Deposit 36 Term with equal monthly repayments with Gst on purchase price Factored back into repayment structure. Seek solutions for areas out of balance BALANCE. KUBOTA POWER TO MOVE WATER Where and when you need it most. Serious power and reliability + Compact, low noise and environmentally friendly + Pre-assembled, saving installation time and costs + Capacity 20HP to 96HP Speak to your local dealer to find out more. Dairy farmers Ian and Amy Mathers hosted a visit by Deputy Prime Minister, Michael McCormack. $100 million will exit this shire before this ends,” Mr Mathers said. Mr McCormack acknowledged the northern Victorian dairy industry was hurting. He said the government had provided $7 billion in drought assistance and would continue to support the community. The assurances did little to reassure the crowd. Dairy farmer Stephen Brown said Mr McCormack danced the dance, but it meant little. “There was no joy in the room today and they all live in la la land,” Mr Brown said. Gibbs from Primary Partners organised the visit. He acknowledged it was good Mr McCormack spent five hours in the town. “The decision-makers need to know what is going on. From October to March, 15 300 milking cows have left the shire (they would have produced enough milk for 396 000 homes for a year), no-one is being held to account and if we continue to do nothing, nothing will get done,” Mr Gibbs said. Continuing dry conditions and soaring temporary water prices are placing increased pressure on the farming community. Young couple eyes future in dairy farming YOUNG DAIRY farmers Cody Tricky and Rachael Barnes hope to one day make Cody’s family farm their own. Cody and Rachael, from Finley, are working hard to achieve their goal and are well on the way to building up their own milking herd which includes around 70 head. Cody and Rachael are well aware of how hard it is in the industry but this hasn’t deterred them from still wanting a future in dairy farming. “We are only 21 and we know things are pretty tough at the moment. Water is our biggest issue moving forward, not just for the dairy industry but the whole community who is suffering alongside us,” Cody said. This year they purchased 16 three-monthold cross-breed heifers for $40 and they have plans to join the more Jersey-like animals back to Jersey and the black and whites to Holstein. The business is currently milking 270 cows but that number could reduce even further if the drought continues to bite. Normally they would have 12 months of fodder up their sleeve; this year they only have weeks. “We will start to work a bit of ground up, plant some cereals and pray for an autumn break,” Cody said. In a normal year they grow rye and cereals on irrigation, with a bit of dryland cropping thrown in. They do grow lucerne and some sorghum but 2018–19 has definitely been on the ordinary side for fodder production. In November last year the family business joined the Victorian Dairyfarmer Consortium after previously supplying Murray Goulburn for 28 years. Cody Trickey and Rachael Barnes with Llandovery Queens Claire1969th, the Reserve Champion All Breed at this year’s International Dairy Week. *For New John Deere Turf & Utility Equipment. for ABN Holders through John Deere Finance on all 0-50Hp Compact Tractors. Terms and conditions apply. Finance Offer based on 1/3 Cash Deposit over 36 equal monthly repayments with GST value of purchase factored into repayment structure. Offer ends 31/3/2019. † Like for like specifications. Ask in-store for more details. Cody loves working with machinery and growing crops while Rachael’s love lies in the cows, especially Illawarras. She developed that love while working with them at high school through the school’s agricultural program. “I love the cow side of farming. I got introduced to showing and every year I would fall more and more in love with it. I love seeing an animal I have worked with and prepared, out in the ring,” Rachael said. got the one we were after and I am so excited,” Rachael said. “We had a good look around the herd on inspection day and to me she was the best, most correct heifer, and her pedigree was great. “She is due to calve in April and we have plans to get her in the ring after that,” Rachael said. Repairing and the Champion in Liquid servicing Nutritionhydraulics for the dairy industry the Champion Liquid Nutrition Champion in LiquidinNutrition in Liquid Nutrition After-hour breakdowns can be very costly. GV Hydraulink’s new rotary dairy drive system can be very cost effective and suits most brands and operates by a flick of a leaver. The project builds on a decade of existing research and the experience of 50 farms across Australia who have decided to invest in the technology. In their presentation at The Murray Muster, researchers will share the fundamental concepts of successful AMS farming and the major differences between conventional and robotic systems. The researchers will also present performance and economic data from current AMS farms in Australia and overseas. “We want to help farmers optimise AMS,” Dr Lyons said. “That means understanding what robots can and can’t do; and setting up the farm and processes to make the most of the system. Or for others it might be reading and interpreting data, and then knowing what to do with it.” You can catch the Milking Edge team on day one of The Murray Muster — Murray Dairy’s two-day regional event on May 22–23. Tickets are available online or by calling Murray Dairy. From ploughing, sowing and cultivating to transporting, harvesting crops and NO DPF front loader work – the new 6 Series tractors are as versatile as your daily work is varied. Maximum manoeuvrability, supreme efficiency and unparalleled operating The new 6 Series provides the best technology mix in its class. Deutz-Fahr have expanded comfort are trademark features ofcrops the new and 6 Series. The modern bonnet design, the series with five compact, four cylinder tractors in the low to mid horsepower From ploughing, sowing and cultivating to transporting, harvesting category: the 6130 and 6140 which are available with TTV features or Powershift stunning in the cab alltransmissions. blend in seamlessly with the complete model range. category: the 6130 and 6140 which are available with TTV or Powershift transmissions. Water Minister David Littleproud speaks to dairy farmers and other irrigators in Mooroopna. Sally Mitchell and Barry Ashwin. OUT OF dairy, into beef. The dairy herd has been sold and the couple will be moving into beef. production and therefore total herd output. A recent study3 showed that post calving control of gastrointestinal worms with Epricare can reduce first-calving heifers’ average calving to conception interval by 12.9 days, when compared to untreated cattle. If achieved, this can increase saleable milk output by around 250 L#, at a value of $114 per first-calving heifer in the milking herd. * Although efficiency and productivity can compete within a business, it is possible to find the right balance through assessing the ROI of farm inputs and activities, and selecting the ones that bring the highest returns to your business. As you can’t accurately manage something that you can’t measure, talk to your local CRT store or call your Boehringer Ingelheim territory manager about assessing worm challenges in your herd throughout the year, and selecting the most effective drench program for your operation. losses if it continues to remain dry. “We have financial commitments and we can’t just stop milking or farming. On a positive, milk price is being talked up — but it needs to be,” Mrs Woods said. Closing date for applications Wednesday, 8th May 2019. 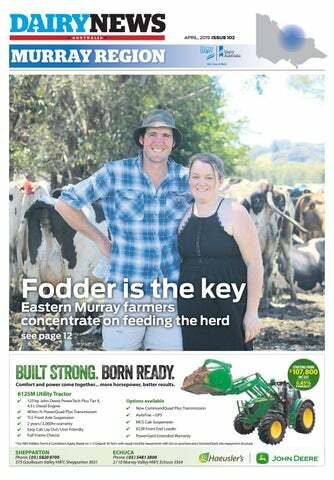 Former Murray Dairy Focus Farmers John and Elise Pethybridge from Whorouly have learnt a lot from their two-year tenure, lessons they have incorporated in to their management moving forward. GRAB, SLICE & FEED OUT ROUND BALES... FASTER! Only the patented Keltec round bale slice lets you pick up, unwrap and slice round bales for feeding out, without leaving the tractor cab. The plastic wrap and netting is removed while the bale is being cut so you don’t have to leave the tractor cab, making it perfect for direct loading into fodder wagons or feeders. MURRAY REGION // 13 “It would be nice to get all the start to align but the next six months will certainly be interesting.” taught him to look at every aspect of the business objectively and always ask questions. “It is so important to grow as much homegrown feed and silage as possible, especially in a season like this one. We have maximised ours and did the best we could with the cards we have been given.” Like most areas, the Whorouly rainfall has been well below average this season but an opportune 50 mm dumping in December did help the sorghum crop. John said looking ahead to next season, establishing an autumn feed base remained a major priority to ensure a 2019–20 season. “We won’t have a huge area to start with but it will be close to the dairy for easy grazing access.” He said the business has been focusing quite heavily on soil fertility over the years and recent soil tests had indicated a significant improvement. “We might be able to take the foot off the pedal this year with our fertiliser use and save a few dollars.” John has also been able to export a few spring heifers to take some of the pressure off along with selling any empty spring cows. The herd is still averaging 25 litres. “Odds would dictate milk price will be significantly better next season,” John said. The business will be approaching autumn with a 290-cow milking herd. The Pethybridge family has been supplying Dairyfarmers for two years and John is really happy with the way the company operates. “That’s one less thing we have to worry about; we left Murray Goulburn and the mental side of things has improved significantly — but price is only one part of the puzzle,” he said. as much milk as possible and they are going to have to pay for it.” He said in his area the only milk supply option has Murray Goulburn, but since Dairyfarmers, Fonterra, Bega and ACM moved into the area, he has been able to mitigate some risk. Providing highly palatable feed with all your nutritional requirements from birth to entering the dairy. ¡ Heifer grower ¡ Bulk, Bulka and 25kg bags available All our calf grains are specifically formulated to meet your calves requirements our highly palatable mix now with Molasses included. When you are considering your calf grain options why not give the locals with the know how a call at Rex James Stockfeed. generates a number of critical efficiencies for Bubs — the production and ingredient cost are significantly reduced, making the new production method margin accretive.” Successful trials have already been completed, with the final product bound for major supermarkets and pharmacies in Australia and e-commerce platforms in China, with an option to renew the contract for a further three years. Bega Cheese chief executive officer Paul van Heerwaarden said the company was looking forward to producing the product, which could be “genuinely positioned as Australian”. cows could not recover and lost their production potential, which could imply that dairy industry should avoid calving in summer period, unless there is an efficient heat stress mitigation strategy in place on-farm.” Dr Cullen said future study would be conducted with Robotic Milking System to understand the impact of consecutive heat stress events’ impact on cows with different stage of lactation and diverse genetic background. The study was published in Australasian Dairy Science Symposium 2018 Proceedings. The work was a collaborative effort by Dr Paul (Long) Cheng, Dr Brendan Cullen, and Prof Frank Dunshea from the University of Melbourne, and Chole Charlot from AgroParisTech (France), and Dr DongWen Luo from AgResearch (New Zealand). This May, pull on your boots for our inaugural industry event, The Murray Muster. Over two days and one night, hear from Australian and international guest speakers with new research and rigorous discussion on Automation, Consumers & Climate. The Murray Muster 2019 will get you thinking about what comes next for the dairy industry in the Murray region. DAY 1: WEDNESDAY, MAY 22 Ever considered an Automated Milking System (AMS)? Get real information on the potential of this technology from the Milking Edge team, with a decade of research, data and analysis from commercial farms across Australia. Join US professor, Russ Hovey, to have a close look at the udder to better understand mammary function and development, and improve the prevention and management of mastitis in your herd. Dr Hovey will also highlight how we can be on the front foot when it comes to animal health and welfare issues. DAY 2: THURSDAY, MAY 23 Hear from a panel of dairy farmers about their business plans for a future with potentially less water and more volatility. Talk to the Dairy Australia and Murray Dairy leadership teams about effort and investment to ensure a sustainable, forwardthinking dairy industry in this region. Protect your Milk Quality and Profit ND Services compact chillers provide powerful water and glycol cooling. Snap chill your milk on the way to the vat, with a fast cooling technique, providing a cost-effective way to match capacity to demand. With chillers ranging from 10-160kw, we have the right size for your farm. Give us a call to discuss your cooling requirements.